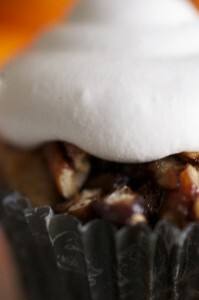 This past summer we had a follower suggest we make a sweet potato cupcake. 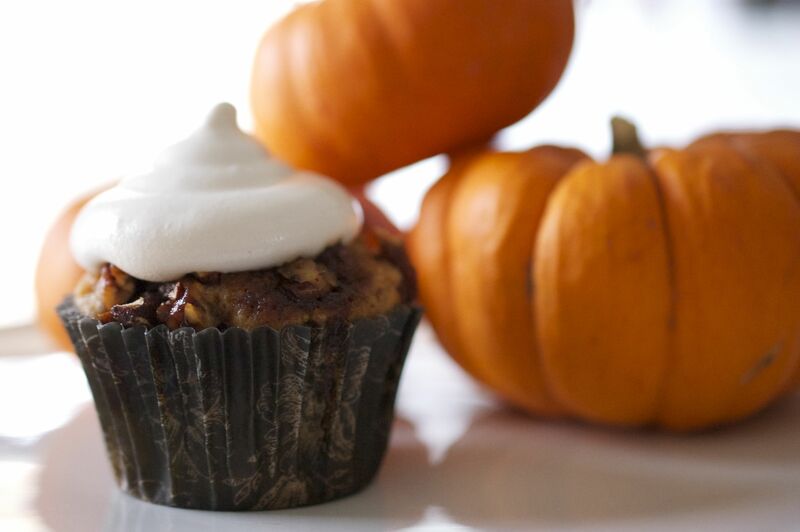 We immediately added it to our fall baking list, knowing that the flavors lent themselves to the season. Luckily we were able to fit these delicious cupcakes into our busy baking schedule. We decided that our spin on these cupcakes was to make them a dessert rendition of a savory/sweet Thanksgiving classic, Sweet Potato Casserole. The result is an earthy cake with crunchy spiced candied pecans, and a delicious homemade marshmallow icing to finish it off. We made some modifications to our original candied pecan recipe that we used this past summer with our carrot zucchini vanilla cupcakes, and came up with a spicy alternative that was perfect for adding a crunchy and slightly savory dimension to our sweet potato cupcake. These would be a welcome addition to any holiday dessert table. In a medium bowl place flour, cinnamon, ginger, nutmeg, salt, baking powder, and baking soda in a bowl and whisk to incorporate air and break up any clumps. Set aside. In a separate bowl mix together sweet potatoes, sour cream, eggs, and vanilla extract. Set aside. In a stand mixer beat butter with sugars until smooth. Add half of the sweet potato mixture and mix until combined, scraping the sides of the bowl. Add the other half of the sweet potato mixture and finish combining with the sugar. Add the flour mixture and mix on low until just incorporated. 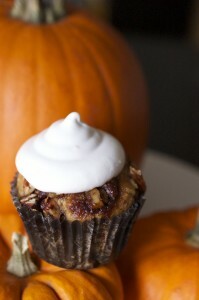 Fill cupcake liners ⅔ full and top with chopped candied pecans. Bake at 350°F for 15-18 minutes or until a toothpick comes out clean. Let us know how they turn out. Enjoy!